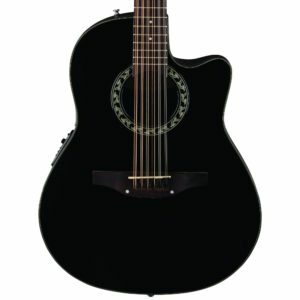 Looking for an acoustic-electric guitar to engage in music art or looking for something better than your old instrument? Then you are in the right place. 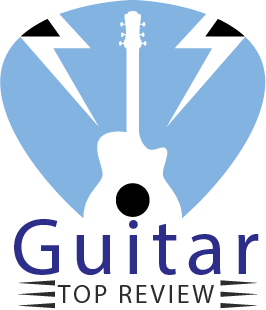 Today, we will review the Ovation AB24-5 Acoustic-Electric Guitar, Applause Balladeer Cutaway Dreadnought, which will maybe give an end to your searches. Let’s see what this guitar is without further ado! The guitar is comprised of a solid spruce top with a black finish and round-back Lyrachord body, ensuring the great durability and balanced tone of the guitar. The one-piece solid spruce top of the guitar is very thin but strong, making the guitar quite lightweight for its sturdiness. The round-back Lyrachord body attaches greater volume and projection to the guitar, contributing to its excellent balance and durability. 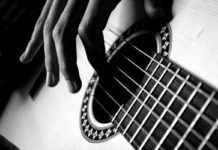 The materials not only make the guitar an instrument with great sound but also attach pleasantness to the eye and touch. The body of the AB24-5, Applause Balladeer features mid-depth cutaway for a unique appearance. The Nato Neck with Satin Finish and rosewood fingerboard greatly add to the premium quality and comfort of the guitar’s body. Besides making the image of the guitar remarkable, the mid-depth cutaway design has its own benefits to the comfort of the guitar. It makes the access to the end portion of the fret much easier for the player. So if you frequently stay in the zone closer to the body, cutaway guitars are a great choice for you. Despite the strength of the solid spruce top, the guitar isn’t even remotely heavy. Excellent weight-to-strength ratio makes spruce tops both durable and lightweight for increased comfort. Obviously, less weight means that you will get less tired during your plays! Correctly regulated guitar neck won’t let you worry about any readjustment. The strings won’t unnecessarily touch the frets causing buzzing and other undesirable sounds, which will keep the level of your performance at the top! Moreover, the easy-playing neck profile will prevent the premature fatigue and help you deliver more masterpieces to your audience! Another great cutaway design we found was in acoustic-electric bass guitar, which not only looks amazing but also sounds incredible. This acoustic-electric guitar features an excellently balanced sound. Although the mid-depth cutaway somewhat weakens the bass of the sounding, the guitar sounds more balanced than full-body guitars. Worried about buzzing? Think about it no longer as the balanced neck of the guitar won’t allow any unwanted sounds to disturb the sounding of the guitar. Besides aesthetic touch, sturdiness, and lightweight, the spruce top actually develops the very base of the outstanding sounding of the guitar. Generally, spruce-top guitars sound more resonant and won’t get overloaded during the most active plays. Moreover, they mature with time and deliver better sound. Add to that the balancing feel of the cutaway, and you get a marvelously balanced sounding from the guitar. 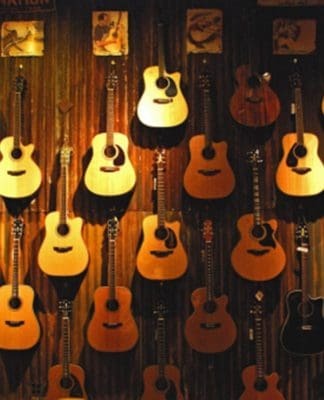 Are you a beginner and don’t know what amplifier and tuner to choose for your first acoustic-electric guitar? Worry no more as the built-in preamp tuner eliminates the necessity to acquire dedicated equipment from the get-go. Until you get well-acquainted with acoustic-electric and its equipment and find the right preamp and tuner, you can use the built-in ones to develop the very base of your knowledge about them, making it a great temporary choice for beginners. Besides, you might simply not have enough space at your home to keep the acoustic-electric guitar with all its attachments and equipment, so the onboard preamp and tuner will really be a saving measures for you. Another great thing about this guitar is its limited lifetime warranty! Solid spruce top with a black finish for sturdiness, lightweight, and resonant sounding. Mid-depth cutaway makes the sound of the guitar more balanced and refined by reducing the bass. Besides, the cutaway makes it easier for you to access the last frets of the fingerboard. Premium rosewood fingerboard and Nato Neck with Satin Finish for comfortable play. Built-in preamp with tuner allows you to postpone the purchase of separate equipment and doesn’t require as much storage space. While the built-in preamp and tuner will probably satisfy beginning guitar players, more experienced individuals will surely notice that the sound differs significantly from the full-sized analogs. The reduction of basses by the cut-out might make the sounding of the guitar too bright. This model of acoustic-electric guitar isn’t shipped internationally by Amazon. Should I get a full-sized amplifier and tuner for this guitar? While the onboard equipment of the Ovation AB24-5 might be sufficient for the most of the people, more experienced players surely won’t be satisfied with its sounding characteristics. If the sound quality of the preamp is a priority for you, you should definitely get a separate amplifier and tuner for your acoustic-electric guitar. Keep in mind that every piece of equipment sounds differently, so you should try your guitar with a couple of amplifiers before making your final choice. If you do not need much from the equipment and in addition to that don’t have much storage area at your home, you don’t need to get a full-sized hardware for the guitar. Will the cut-out design of the body affect the sounding in a negative way? As sound is greatly subjective, we cannot surely say whether you will consider the reduced bass of the guitar better or worse. If you are going to pick this guitar or any other one, try playing on them to understand which aspects of their sounding you like and which ones you can’t stand. Besides, the amplifier of the guitar will somewhat counteract that loss in the bass, so if you like a specific guitar for its appearance or any other characteristic but the lack of bass is the only thing bothering you, try to play with its onboard or full-sized amplifier to see if it changes the sounding to something you like more. As the review has shown you, the Ovation AB24-5 Acoustic-Electric Guitar, Applause Balladeer Cutaway Dreadnought has some great features, making it a balanced, comfortable, and well-sounding musical instrument. Of course, it has its own downsides, but they can be easily neutralized with preamps and tuners. 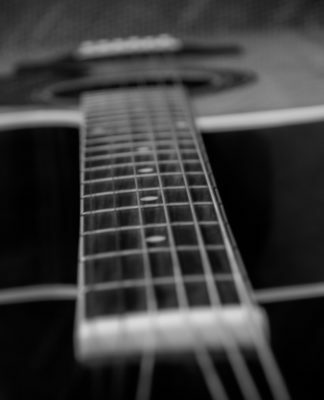 Besides, you may find out that the more balanced sounding of the guitar suits your musical taste more. If the built-in amplifier doesn’t satisfy your style, you can always find matching equipment to make your performance more complete for you and your audience. We hope that our today’s review shed some light and will make your search easier. We wish you to have a nice buy! Previous articleEpiphone PR-4E Review: Starter Choice!